TOKASHIKI ISLAND, Japan (April 6, 2009) -- Scarlette's rainsoaked crew weathered 10-foot waves -- while the Japanese Coast Guard searched for the beleaguered father and son crew with two ships and two airplanes -- during a return trip to Okinawa that lasted nearly 11 hours. "We definitely were happy to dock Scarlette," said a worn-out Cap'n J after the mammoth journey. "For most of the day we had severly light winds as we shoved off from the dock at Tokashiki Island at 11 a.m. and attempted to sail to our homeport at Kadena Marina." 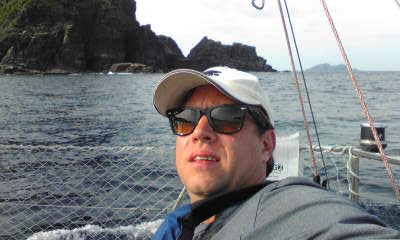 Around 3 p.m., former "Mental Floss" owner and fellow sailor Delaine Rivenbank, called Cap'n J with a weather warning. "You better put a reef in the sail Adam and break out your storm sail," said Rivenbank. "There's a storm headed your way. Where you at?" "Just south of Chi Bishi," said Cap'n J. As the winds started to pick up, Cap'n J was glad to finally get some wind in Scarlette's sails, but could see the dark clouds looming on the northern horizon. Storm coming, Cap'n J failed to head Rivenbank's warning. At 3:50 p.m. Rivenbank called to check on Scarlette's progress as she was approaching Chi Bishi -- a small reef area about half way to the Keramas from Okinawa -- that lays home to a shipwreck and at times strong currents. Nine minutes after that call, the skies opened up and rain started dropping in buckets. 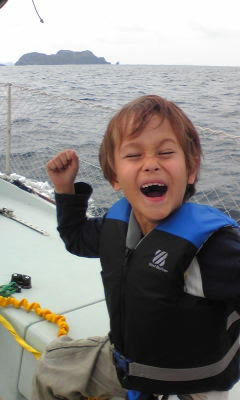 With seasick Second Mate Kai laying against the starboard side nets, the rain started to fall. "Kai you need to get inside the cabin," said Cap'n J. "But I'll get even more sick," complained Kai. "If you stay out here you're going to get soaked." Then came the 20 knot winds and 10-foot waves. As Scarlette's skipper wrestled with the ship, the sails went crazy, and he lost control of Scarlette during one of several 180 degree wind whips. "My main concern was to stay off the reef at Chi Bishi," said Cap'n J. "I kept looking at my GPS screen and could see us drifting closer and closer to the area where a barge had shipwrecked on the shallow reef there. It was a struggle to keep us off that reef and the wind and current kept pushing us toward that reef," he said. First thing Cap'n J did was drop the sails while steering the boat with his foot. "I dropped the main sail and sheeted it down, but the wind was strong. As I moved forward Scarlette was healing pretty steep but I had to get the jib sail (front sail) down so I could regain control of the ship," he said. "I was tethered to the ship -- like Kai -- so I wasn't that afraid of getting knocked off. Paying for the extra safety feature was great for piece of mind," he said. "I could remember telling myself, 'stay calm, you're the one that's going to get us out of this -- you and only you," he said. "After I got the jib sail down, I told Kai to hand me the sail ties so I could tie down the sails," said Cap'n J. 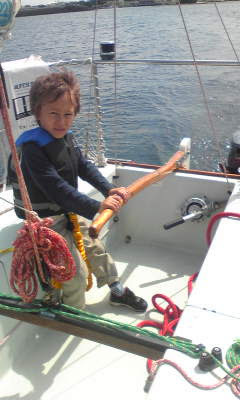 Despite being sick and already throwing up, Kai was able to muster the strength and hand the sail ties up to the skipper like an expert crewman. "Kai was pretty brave for a 7-year-old," said Cap'n J. After getting the sails tied down, Cap'n J dropped the 5hp Yamaha engine into the water, cranked it up and headed toward the wind trying to keep Scarlette from getting knocked down (tipped over) by the waves. As Cap'n J regained control of the ship, he pointed the bow north toward the wind and started riding over the waves. As the bow started slamming down after each wave the stern would lift out of the water and the propeller would scream through the air without the restraint of ocean water. Hearing this ghastly sound, a scared Kai started repeatedly yelling, "Daddy, it's time to call the Coast Guard." "No, not yet," said Cap'n J. "The worst part is almost over," he said trying to reassure his scared shipmate. For nearly an hour, Cap'n J battled the waves and current as he kept drifting toward the reef. "Finally I started "winning" and we were pulling away from the reef, then the traveler pulled out and the boom swung out all the way to the end not in the main sheet," said Cap'n J. "I looked up at the boom and the first thing on my mind was to get that pulled back in before it became a deadly catapult," he said. Trying to jury rig the traveler as he pulled in the boom, Cap'n J couldn't fix it. With the rig broke, Scarlette started to redrift back toward the reef. "At this point I was a little scared," said Cap'n J. "But I didn't want to show how scared I was to Kai because he was depending on me and I thought if I sound panicky he's going to tell and really get scared." Several times, Kai yelled "Daddy, are you out there?" after hearing water splash, the bow smack the backside of the wave as he climbed over or the engine scream. "I knew Kai was terrified and I didn't want to make it worse so I kept telling him, "We're almost through it, Kai." "Frankly, I didn't know how long it was going to last," said Cap'n J. "But he's my kid and I remember telling him, "Don't worry. Stay calm and don't panic. Daddy won't let anything happen to you." After nearly two hours, Scarlette finally got through the storm. As the seas calmed to about six to eight foot, we ran out of gas. "Uggh!" said Cap'n J. "You've got to be $#!$ kidding me!" As he sat on his knees in the cockpit of Scarlette he started thinking. "Now what are you going to do." Last summer, Cap'n J had bought a new engine but the gas tanks didn't match and the hoses couldn't be interchanged. Reaching into the portside laserette, Cap'n J pulled out the spare gas tank and the active tank and poured half of the spare into the active. "Gas was everywhere," he said. "I totally doused myself. The cockpit got really slick but I was able to get both tanks stored and crank up the engine after several pulls between swells." Chugging toward Okinawa at a slow speed of about 3 mph dusk was approaching. "Right around dusk, I was looking to see if I could see land when I noticed the wake from a black object. At first I though it was a huge speed boat headed our way," said Cap'n J. "Then I saw the flippers follow through." I said to myself, "you're shitting me." I wasn't on a whale tour and Scarlette was apparently near this migratory path. "I was both amazed at the beauty of the whales breeching about 150 yards of the portside-bow and called up Kai to get a glimpse," said Cap'n J. "But while I watched the huge humpback whale breech, I was also thinking, I hope one of them $%$!#% don't jump out of the water and land on us." Scanning the now darkening horizon, I kept looking to see if any whales were closer to us. I didn't. I was hoping these whales had heard enough boat engines to recognize us. We were headed right toward these whales and I didn't know which way I should turn. About 20 minutes later, I saw one whale breech about 60 yards behind us and hoped that we had made it through and the whales were behind us. About 30 minutes later, the GPS battery went dead. Without land in sight, Cap'n J yelled down to an unresponsive Kai. "I pulled on his tether several times, I knew he was sick but now he was not answering me, I really started to get worried about him." I asked him to hand me the cell phone so I could call Tomoe. As he placed the cell phone on the deck, Scarlette healed and the phone went sliding across the deck toward the starboard rail. "I quickly grabbed the phone as he almost went over the side," said Cap'n J. "Whew! That was close. As I flipped the phone open, the screen was black meaning it either got wet or the battery was dead." Later I found out that the battery had died. I asked Kai to flip on the running lights as it was now dark and the lights failed to come on. "Flip every switch," I said thinking seasick Kai had flipped the wrong switch. "Flip it again," I said. No lights. Without running lights, larger ships would be unable to see us. "So, I told Kai to hand me up a large flashlight I would use as an emergency signalling device," said Cap'n J.
I tied the light to the mast in case it slipped out of my hand. With the tiller (steering wheel) in one hand and the flashlight in the other I pointed Scarlette toward the lights I could now see on the horizon. The waves were still pretty big and every five minutes or so, I get a bigger swell, but I kept the ship pointed toward the lights and was looking for the two huge towers of the Okinawa Electric Company. Finding them, I kept them in sight. Then the engine died, again. "Daddy, are you out there?" said Kai. "Yes, I said shining the flashlight into the mirror inside the cabin where he could see my face by looking back in the mirror." To cut down on the fuel spillage this time, I took an empty water bottle and had Kai hand me a knife to cut the bottom off so I could use it as a temporary funnel. "That cut the gas spill down, big time. I didn't get soaked with gas this time." After pulling on the engine for 10 minutes, it wouldn't start. I cussed, I spit and was about to call for help. When I gave it one more try, it fired up. Worried about running out of fuel again, I kept us going at a slow pace toward the lights and Ginowan Marina. "Are we almost there?" asked Kai. "Yep, almost there." I lied. "I had no clue how long it was going to take and if we were going to make it to the alternate marina." After another hour and a half, I spotted the buoys for Ginowan Marina my alternate weather port. "I was scared another ship might hit us, I'd run into one of the unlighted buoys or we'd run aground on a shallow reef near the marina," said Cap'n J. "I had never entered this marina -- day or night -- and fortunately we just got lucky...no reef, no ships and no buoys." After getting Scarlette docked, I woke Kai up nearly slipped on his vomit on the floor of Scarlette. With my life jacket and harness still on we found our way out of the marina, crossed the street toward a grocery store to find a pay phone to call Tomoe. No pay phone could be found. "Nowdays almost everyone has a cell phone in Japan, so they've been quietly getting rid of all the public pay phones, because people just don't use them anymore," he said. We talked to a store clerk and she told us there might be a pay phone at a convenience store around the corner. We quickly walked there, found a phone and called Tomoe. "After nearly screaming, Tomoe broke down crying out of happiness to know we were OK. "The coast guard has been looking for you guys." "I'll be home in about 20 minutes," I said. "We grabbed a taxi and when we stepped out in front of our house, Tomoe again broke down in tears." I wasn't real proud of that moment for putting her through that. But I never intended to do that and I was damn glad to see her again. While riding back in the taxi, Tomoe had called Delaine who had had his sons searching the horizon with a telescope at Kadena Marina for our ship lights and the Japanese Coast Guard to tell them that we had called and that we were safe. The Japanese Coast Guard called off it's search. But asked us to stop by their office at 9 a.m. sharp the following morning to file our report. "This was one of the most thrilling adventures, I'd ever been on," said Cap'n J. With a smile, Tomoe asked me, "So, when are you going to sell that boat?" I quickly responded, "So I can get a bigger boat?" TOKASHIKI ISLAND, Japan (April 5, 2009) -- The well-rested crew of Scarlette took a taxi to the southwest end of this island Sunday morning in a tour that included panoramic vistas, snorkeling and beachcombing on this island 25 miles off the coast of Okinawa. 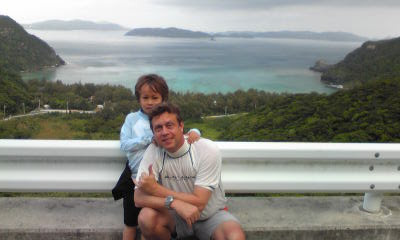 Second Mate Kai had wanted to go snorkeling in the Keramas -- one of the premier spots in the world to do just that -- and he saw several fish but mostly held his dad's hand in the cool aquamarine waters of Tokashiki's Arahen Beach. 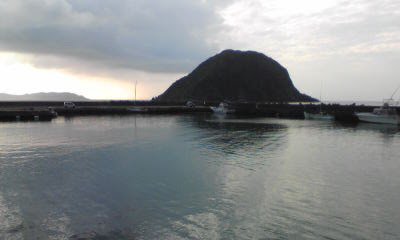 Scarlette -- the only sailboat in Tokashiki Harbor that day -- can be seen against the concrete dock just to the left of an island named Gusuku Shima. The day started out with a quick preparation of Scarlette -- a 1985 J/24 sailboat -- so the launch of the ship on its return to the main island of Okinawa would go a little faster. "I knew we would have some rain in the afternoon on our return trip, and Kai had been wanting to go snorkeling so I told him, we could go as long as he was OK with the fact that we'd probably get rained on going home," said Cap'n J. 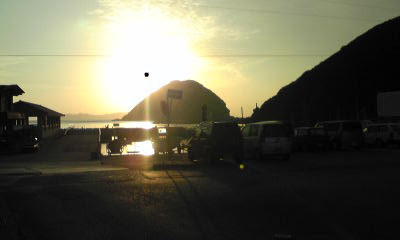 The morning sun fools my cellphone camera and acts like an eclipse (it wasn't) during the morning check of the boat in Tokashiki harbor. The island in the background is Gusuku Shima. Shima or Jima means island in Japanese. And depending on the first words ending vowel you use either shima or jima. As in Iwo Jima. Second Mate Kai chose snorkeling. After prepping the boat -- removing all the canvas covers and pre-setting the jib (front-sail) -- we rode scooters around the harbor area to shoot photos and have some fun. "When we arrived at Tokashiki we took a different route to the Japanese inn where we passed several dogs," said Cap'n J. "We avoided these dogs at night in case one of them started chasing us and we did the same during our morning check." "Let's avoid the dogs again, Daddy," said Kai as he raced ahead on his scooter. The crew scootered around the harbor andCap'n J shot pictures of Kai near the harbor reception area, a bus with Tokashiki Island on it and a colorful wall with fish painted on it. 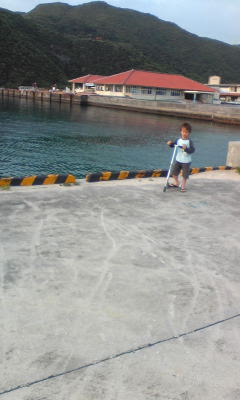 Second Mate Kai rides his Razor scooter along the dock at Tokashiki Harbor. The building in the back in the main harbor office and is where the ferry from the mainland stops and drops off and picks up passengers. Right behind Kai you can get a small hint at how aquamarine the water is in the Keramas. 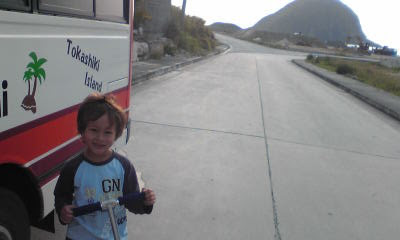 Second Mate Kai stands next to a bus with Tokashiki Island on it during our morning scooter ride around the harbor. 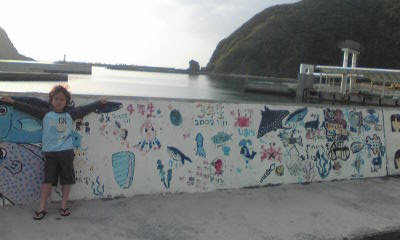 Second Mate Kai stands next to some artwork along a wall at Tokashiki harbor. Tiring of the photos, Kai said, "Race you back to the hotel!" and off he went passed the only stop light on the island and up a small hill toward the minshiku. At breakfast the owner once again did not let Scarlette's crew down. "She practically cooked us a full English breakfast," said Cap'n J. 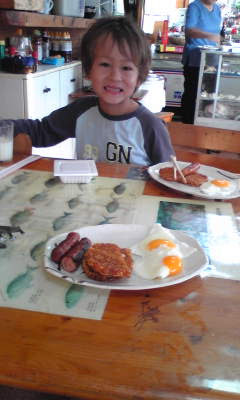 "Eggs, toast, sausages, it was unbelievable that we were getting essentially an American breakfast in a traditional Japanese Inn," he said. "For those that have never stayed in such a place this probably seems like no big deal, but for those who have stayed in a minshiku may agree that this is virtually unheard of," Cap'n J said. "Usually it's 'shutup and eat your breakfast fish' in a normal minshiku," he said with a laugh. Second Mate Kai digs into the breakfast buffet which included a full American style breakfast virtually unheard of at most traditional Japanese inns. The counter -- one like you'd find in an old dime store -- was filled with shells assumed found throughout the Keramas. Eggs sunny side up, sausage and hash browns? This breakfast was our savior and very unusual to eat at a traditional Japanese inn. The white box in front of Second Mate Kai is nato. Nato is fermented beans. My kids and wife love that for breakfast. I can't stand it. 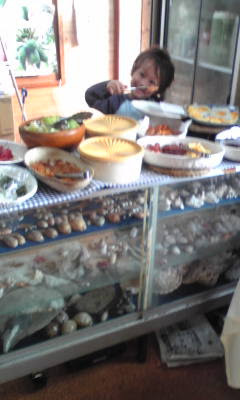 After breakast, the minshiku owner even allowed the crew to make sandwiches from the breakfast buffet for lunch for the return trip home. "This Japanese Inn was awesome, a little old inside, but you kind of expect that. What made our stay was the owner who always had a smile and did an awesome job of making our stay at her place as enjoyable as possible," said Cap'n J. While the crew changed into swimgear, the inn's owner called a taxi. The taxi driver was totally island friendly. On the way to the other side of the island she explained that we could not leave any bags on the beach because the crows -- yes crows -- would carry the stuff away. "No matter how big the bag, they'll be able to carry it away -- so don't leave your wallet or cell phone in the bag because it might get carried away," she said in Japanese. "At first it took me a little while to understand, but then Kai helped out with translation," said Cap'n J. "I gave my wallet to her for safe keeping and she dropped us off at Arahen Beach," said Cap'n J.
Japan has a low crime rate. Second Mate Kai and Cap'n J pose for a photo over a harbor on the west side of Tokashiki Island. You can get a glimpse at how aquamarine the water is in the bay in this photo. The scenery looks like a photo backdrop but is actually the real deal. Simply beautiful and one of the reasons why I wanted to show Kai what the Keramas looked like. Before leaving the taxi driver told us which stores around the beach that were more expensive and which ones were cheaper. She also left a card with her cellphone number on it and saying call me when you're ready to go back. 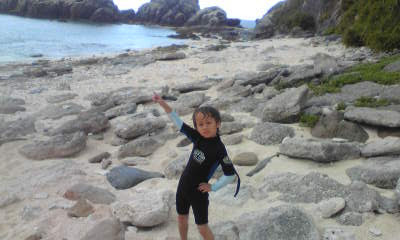 Second Mate Kai poses all decked out and ready to snorkel at Tokashiki Island's Arahen Beach. Sand was pretty tan and the water was aquamarine but cold. Kai was pretty happy with his own wet suit and snorkel gear. Hanare Shima is the island in the background and would be a great place to paddle out to on a sea kayak. 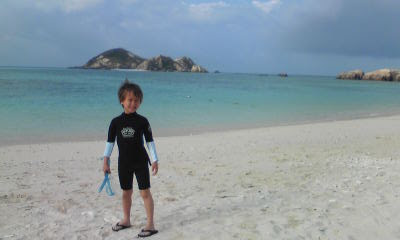 At Arahen Beach, Kai snorkeled and held Cap'n J's hand while he skimmed the surface of the aquamarine but cold waters. Then the crew of Scarlette did a little beachcombing that included checking out another harbor for future trips. 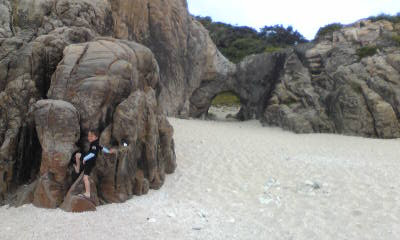 Second Mate Kai tries his hand at rock climbing on Aharen Beach in the Keramas. 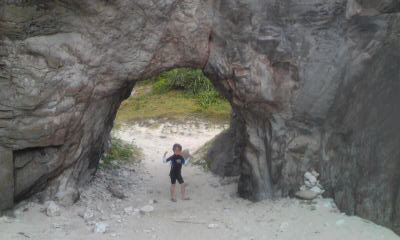 Second Mate Kai stands underneath a natural rock bridge among the rock formations on Aharen Beach in the Keramas. 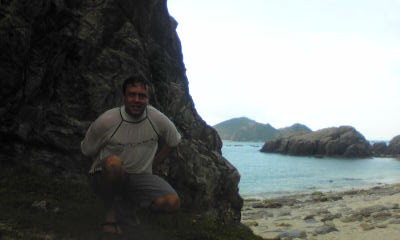 Cap'n J successfully hides his gut among the rock formations on Aharen Beach on the west side of Tokashiki Island during a beachcombing session. Second Mate Kai does his best Travolta move on the natural dance floor of rocks at Arahen Beach on the southwest side of Tokashiki Island. The beach had a mixture of areas: all rock, half rock and half sand and all sand. Although we told our happy go lucky taxi driver to come back and pick us up in an hour, she didn't. When the crew called her she said she was on another call and would comeback as soon as she was done. The crew had brought their scooters for touring on the cheap and we found a Japanese sailor who spoke English and had a bought. 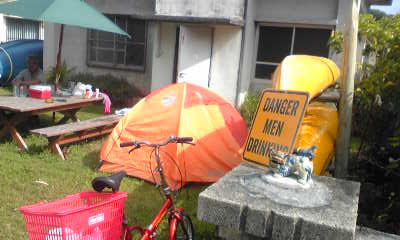 Our introduction to this gentleman was his funny sign, "Danger Men Drinking." 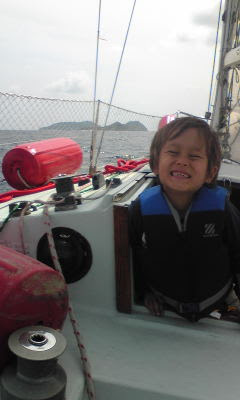 An unknown sailor who owns a sailboat on Okinawa was friendly and amazingly spoke English. In the tent was a Canadian girl who spoke English too. The taxi driver pulled up shortly after our meeting -- she was an hour late -- but it's an island what're you going to do. My approach was the same to the hefty fee -- about 1,500 yen (about $20) one-way -- it's an island and the folks who live here have to make a living through tourism, so of course the taxi ride is a little more expensive. Getting in she handed me my wallet -- nothing missing from it -- and we headed back to the inn for a quick shower, gear gathering and to shove off from the dock. Got our showers, made it to the boat at about 11 a.m. about an hour after I originally wanted to leave. The skies were sunny, the wind was low and as Scarlette headed out of port, her crew was totally unaware of the adventure they were about to experience. PREVIEW: Part 3 includes Scarlette running out of gas twice, whales breeching off the bow, 6 to 8 foot waves that looked more like 10 foot, Kai tossing his cookies several times and yelling call the Coast Guard and his mother calling the coast guard -- who responded with two planes and two ships -- to search for Scarlette during her return trip that lasted nearly 12 hours. The storm free trip to Tokashiki was half of that time -- 6 hours. PHOTO: An overview photograph of the Kerama Islands, a subtropical mix of 22 islands southwest of Okinawa's capital city of Naha. TOKASHIKI ISLAND, Japan -- (April 5, 2009) Scarlette, a 1985 J/24 sailboat, and a crew of two cast off lines from her homeport to travel for an overnight trip to the Kerama Islands about 25 miles off the Southwest coast of Okinawa. Cap'n J and second mate Kai got a late start from the marina after a pre-travel checklist found a fuse blown for the VHF radio. Although both crew were at the marina at 7 a.m. the boat didn't cast all lines and launch until 9:55 a.m.
"This was our first long overnight trip and I wanted to make sure we had everything we were going to need," said Cap'n J. PHOTO: Kai takes the helm of Scarlette outside Kadena Marina while Cap'n J raises the sails as the crews' journey begins to the Kerama Islands. "I had recharged the batteries for Scarlette and when I installed them I blew a fuse on the VHF radio while trouble shooting a problem with the bilge pump. So our trip was delayed nearly two hours," he said. The Kerama Islands consist of 22 islands -- eighteen of which are uninhabited -- off the southwest coast of Okinawa. 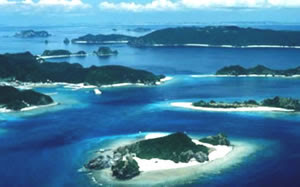 Of the islands that are inhabited are: Aka Island, Geruma Island, Zamami Island and Tokashiki Island. 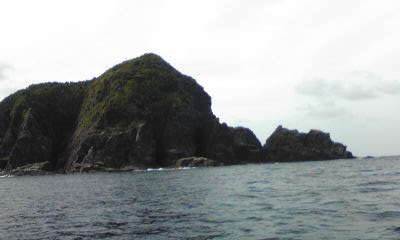 Tokashiki -- Scarlette's destination -- is the closest inhabited island to Okinawa. "I thought the trip would take about six hours," said Cap'n J. "We wound up having a good wind on the way and sailed nearly on the same tack all the way there," he said. ART: An overview from the GPS system on Scarlette shows the route that took her crew about six hours to travel the nearly 35 miles to the island of Tokashiki in the South China Sea. Reports from Kadena Weather included mostly cloudy skies with 10 knot winds from the south east with a high temperature of 70 degrees farenheit (21 degrees Celsius) and a low temperature of 54 degrees farenheit (12 degrees Celsius). The closest weather buoy to Tokashiki (at 26 degrees North and 127.5 degrees South) had a morning forecast of light and variable winds with smooth seas and small short period wind waves, according to Buoyweather.com. The morning winds were to be East South East from 5 to 7 knots and the seas were 2 feet at 5 seconds. The afternoon forecast from the same buoy was the same except that the winds were to change and come from a South East direction. "Once we got into the Keramas we had to manuever Scarlette around a little to take advantage of the lighter winds," said Cap'n J. With land in sight -- but without a landing by Scarlette -- her crew was getting anxious to try their sea legs on terra firma. But with about two hours to go, Cap'n J turned to a tried a true distraction: deep sea fishing. PHOTO: Second Mate Kai tries to reel in a big one off the starboard stern of Scarlette while "deep sea" fishing in the Keramas. Besides snorkeling, Second mate Kai also wanted to try his hand at fishing, so we broke out one of the two fishing poles we brought along just for that. "While I sailed and loaded the hook with small shrimp bait, Kai stood off the starboard side of Scarlette to fish," said Cap'n J. 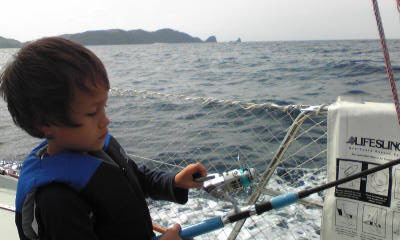 As the bait kept slipping off, Kai's interest in "deep sea" fishing quickly followed. "Daddy, can you turn on the engine?" "These words are almost heresy to the sailing purist," said Cap'n J. "It's taking forever," said Kai. And added, "Are we there yet?" Travel by car -- kids ask, "Are we there yet?" Travel by sailboat -- kids ask, "Are we there yet?" I think kids come with this saying automatically, just like a doll that has a pull string on its' back. "Hi, my name is Barfie!" PHOTO: Are we there yet? Secondmate Kai smiles as we sight land. 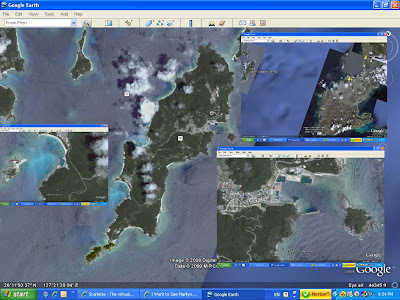 Unfortunately this landmass -- Hate Shima (pronounced ha-tay she-ma) -- is one of the 18 uninhabited islands in the Keramas. The feerless Captain belayed the landlubbers request with a "We need to save gas in case we need it later." These words unfortunately were pretty prophetic for our return trip from Tokashiki. Sadly for Cap'n J the fishing pole trick onlyh works one time. Especially if the fish ain't bitin'. "Wanna read a book?" Cap'n J asked his crew. "I brought two Magic Tree house books," the cap'n tried to say enthusiastically. "How about some crayons?" I brought those too -- a tip in an article I read in a sailing magazine about having kids on board. Those tips about bringing stuff for the kids aboard the boat were nice, but uhhm, they don't work. Cap'n "Up the creek without a paddle"
P.S. Anyway one of your writers could do up an article on how to get crayons out of your bilge pump? As the sun started to hang low in the sky, a somewhat defeated Cap'n J heard the final "Are we there yet?" and dropped the engine and cranked up the engine after rounding a small island that marks the right side of the Tokashiki Harbor entrance. "We made landfall about six hours after we launched from Kadena some 35 odd miles away. After securing the boat and hoisting the gear to the concrete dock, the crew headed to the Japanese Inn we had the firstmate -- who skipped this trip -- call to make us a reservation. They weren't busy as the firstmate reported via cell phone that, "You're the only customers they have to night." The crew got to the minshiku and dropped its bags off. The owner showed us the shower facilities on the first floor and then showed us to our room. A western-style bed. In fact two western-style beds. We then asked what time dinner was she said, "7 p.m." in Japanese. We asked what time breakfast would be, "7:30 to 8 a.m." she replied in Japanese. "Where's a store?" "Around the corner," she replied in Japanese. The crew then headed to the store. The skipper bought a beer "Orion Southern Star" and Kai got a "Coke Zero" then asked to get a jet plane. He had been patient on the trip over, so I caved in. 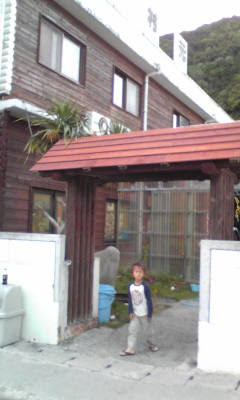 PHOTO: Second Mate Kai stands outside of Muramoto, a Japanese Inn near Tokashiki Harbor, where the crew of Scarlette spent the night. One night stay which included dinner and breakfast cost 5,250 yen (about $58) per person. The owner was extremely friendly and I'd recommend the place to anyone wanting to visit Tokashiki. Back at the minshiku, we grabbed a shower then headed to dinner. Dinner was spectacular. She fixed fried chicken and spaghetti, especially for us. 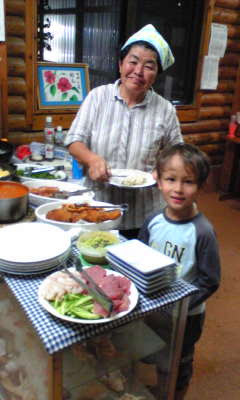 PHOTO: Second Mate Kai stands next to the owner of Muramoto, a Japanese traditional inn, and the night's buffet table. The front plate contains shashimi -- raw fish and cucumbers -- the plate on the right contains fried chicken and sausage and on the left is a big bowl of spaghetti sauce. Muramoto's owner really tried to make our stay enjoyable and talked to my wife several times over the telephone before our arrival. She was concerned that we'd like the food. At other Japanese Inns I've stayed at it's mostly "Shut up and eat your breakfast fish" but at Muramoto the owner gets 5-star marks for trying to please her customers. She also had us stay in the only room that had a traditional Western bed. All other rooms had futons. 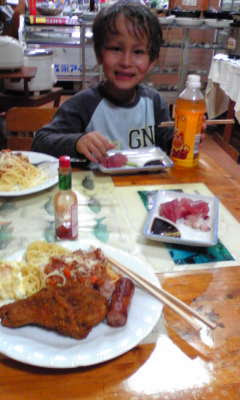 PHOTO: Second Mate Kai digs into the Sashimi -- raw fish -- with a plate of spaghetti on stand by. Muramoto's owner even broke out the Tabasco Sauce to add for taste to the spaghetti she cooked up for us. My favorite was the Sashimi dipped in a healthy dose of wasabi -- Japanese horseradish -- and lots of soy sauce. The fried chicken she cooked up was as good as anything from the South. She even had sausages -- something I can eat for any meal. This minshiku -- Japanese traditional inn -- is definitely a recommended spot. At 9 p.m., we checked the boat to see how much low tide would affect the ropes we tied Scarlette to the concrete dock with. Boat was OK.
We headed back to hotel. I fell asleep, while Kai watched "Narnia" on TV in Japanese. Like the war in Narnia, the winds of World War II placed the Keramas and its inhabitants in a precarious situation. According to the Okinawa Times, the islands were one of the first landing places of U.S. military forces during the Battle of Okinawa. The Times has reported that U.S. Forces landed on Aka Island on March 26, 1945, and went on to take Yakabi Island, Zamami Island, Geruma Island and Tokashiki Island. About 560 residents of Tokashiki, according to the Okinawa Times, committed suicide by order of the Japanese troops stationed in the Keramas to avoid capture by the Americans. Some newspapers have reported that the real reason why the Japanese Imperial Army did this was so that local residents wouldn't give up intelligence to the Americans. The people of Tokashiki have weathered a lot over the years. URASOE CITY, Japan -- (Apr. 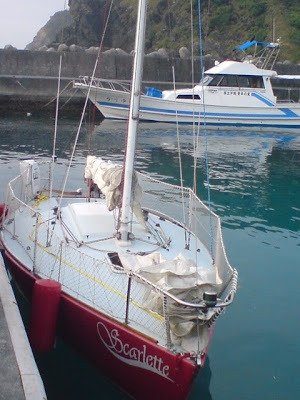 3, 2009) Scarlette, a 1985 J/24 sailboat, will set sail for Tokashiki Island Saturday in the first long trip of it's kind for it's skipper and second mate. Cap'n J and Second Mate Kai will travel across 25 miles of open seas to reach the island south west of the main island of Okinawa. "I've been looking forward for this trip for a long time. The weather window is right so we'll head back on Sunday," said Cap'n J. Scarlette's crew will either stay on the boat or rent a small Japanese Inn on the island. "We'll try to post some pictures as we travel via my cell phone," said Cap'n J. "Got to get to bed, because it's an early morning."